For other uses, see Omphalos (disambiguation). 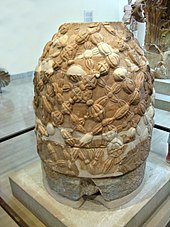 An omphalos is a religious stone artifact, or baetylus. In Ancient Greek, the word ὀμφᾰλός (omphalós) means "navel". In Greek lore, Zeus sent two eagles across the world to meet at its center, the "navel" of the world. Among the Ancient Greeks, it was a widespread belief that Delphi was the center of the world. According to the myths regarding the founding of the Delphic Oracle, Zeus, in his attempt to locate the center of the earth, launched two eagles from the two ends of the world, and the eagles, starting simultaneously and flying at equal speed, crossed their paths above the area of Delphi, and so was the place where Zeus placed the stone. Omphalos is also the name of the stone given to Cronus. In the ancient world of the Mediterranean, it was a powerful religious symbol.Omphalos Syndrome refers to the belief that a place of geopolitical power and currency is the most important place in the world. The omphalos was not only an object of Hellenic religious symbolism and world centrality; it was also considered an object of power. Its symbolic references included the uterus, the phallus, and a cup of red wine representing royal blood lines. Omphalos stones were believed to allow direct communication with the gods. Holland (1933) suggested that the stone was hollow to allow intoxicating vapours breathed by the Oracle to channel through it. Erwin Rohde wrote that the Python at Delphi was an earth spirit, who was conquered by Apollo and buried under the Omphalos. 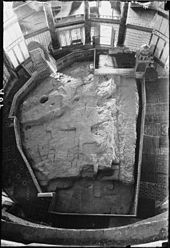 However, understanding of the use of the omphalos is uncertain due to destruction of the site by Theodosius I and Arcadius in the 4th century CE. Omphalos is a public art sculpture by Dimitri Hadzi formerly located in the Harvard Square, Cambridge, Massachusetts under the Arts on the Line program. As of 2014[update], the sculpture has been deinstalled; it will be relocated to Rockport, Massachusetts. Omphalos of Chiang Rai, Thailand. Look up omphalos in Wiktionary, the free dictionary. Wikimedia Commons has media related to Omphalos. Burkert, Walter (1985). Greek Religion. Farnell, Lewis R. (1896). The Cults of the Greek States. Goodrich, Norma L. (1990). Priestesses. Guthrie, W.K.C. (1955). The Greeks and their Gods. Hall, Manly P. (1928). "The Secret Teachings of All Ages: Greek Oracles". Sacred texts. Harrison, Jane Ellen (1912). "Themis: A Study of the Social Origins of Greek Religion". p. 396. Holland, Leicester B. (1933). "The Mantic Mechanism at Delphi". American Journal of Archaeology. 37 (14): 204–214. "Homeric Hymn to Pythian Apollo". The Medieval and Classical Literature Library. Shafer, Joseph R. (2011). Literary Identity in the Omphalos Periplus. Trubshaw, Bob (February 1993). "The Black Stone - the Omphalos of the Goddess". Mercian Mysteries. 14. ^ Voegelin E. (2000). Order and History, Volume 2. University of Missouri Press. p. 31. ISBN 9780826263933. ^ Ciholas P. (2003). The omphalos and the cross. Mercer University Press. p. 6. ISBN 9780865547834. ^ Murphy C. (2007). Are We Rome? : The Fall of an Empire and the Fate of America. Houghton Mifflin Harcourt. p. 44. ISBN 9780618742226. ^ Ezekial 38,12, a homily on the phrase, the nations...that dwell in the middle of the earth. ^ Tanhuma Buber, Kedoshim paragraph 10. ^ "Public art". Cambridge, Ma website. Archived from the original on 29 July 2012. Retrieved 15 July 2012. ^ Edgers, Geoff (November 11, 2013). "Hadzi sculpture in Harvard Square to get fixed, then moved". Boston Globe. Retrieved 28 December 2013. ^ "Homer, Odyssey, Book 1, line 50". www.perseus.tufts.edu. Retrieved 2017-03-04. ^ "Homer, Odyssey, Book 1, line 50 ("navel")". www.perseus.tufts.edu. Retrieved 2017-03-04.